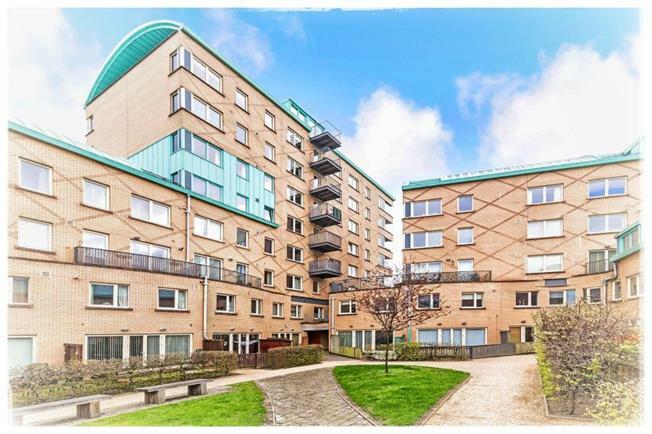 2 Bedroom Flat For Sale in Glasgow for Offers Over £169,500. An incredibly unique and truly impressive duplex penthouse apartment occupying a top floor position with stunning southerly aspects, double height living space and 2 bedrooms including a huge master suite. The property is located on the 7th and 8th floor of the highly regarded Paragon development and comprises of an entrance hall with storage, semi open plan living space with well equipped fitted kitchen with appliances including dishwasher, double electric oven, 5 ring gas hob, fridge freezer and washing machine. The lounge area offers space for dining and gives access to a south facing balcony over looking the quiet inner courtyard. Also on this level is bedroom 2 which is double in size and has a fitted wardrobe, plus the principal three piece bathroom. Stairs off the lounge lead to a wonderful and hugely flexible gallery space, perfect as additional sitting area or large study, off which is the master bedroom featuring a large walk-in wardrobe, stylish en-suite shower and access to a further balcony with stunning views. The property has double glazing, gas central heating, access to a communal enclosed garden along with ample residents parking. The New Gorbals offers a wealth of amenities including a large Co-Op, library and a Glasgow Club Leisure Centre which is just across the road. The city centre is only a mile away and hosts excellent high street shopping, bars and restaurants, public transportation via bus, rail and underground. There is easy access to the motorway network the property is very well placed for the City of Glasgow College Riverside Campus and handy for Strathclyde University.